This month we enjoyed quite an interesting range of chocolate bars. 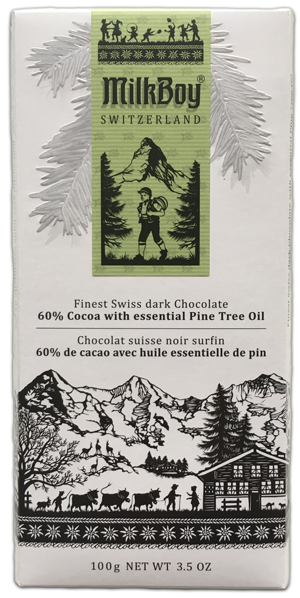 However, before we pull the curtain off this month’s box, we’d like to highlight a really creative way to enjoy a Mystery Chocolate that we heard from a customer. I received a subscription from my daughter for my birthday. The first month (July) my husband and I sampled and enjoyed the bars. That gave us some experience so we branched out some for August to include a couple of our granddaughters and my mother. Next month, I am planning on a group text for everyone to stop by to sample and record their guesses. Then, I will text everyone all the correct answers along with their guesses. We all laughed a lot, and enjoyed tasting and guessing. How cool is that? A group tasting followed by a group text to reveal the answers. Very fun! This bar obviously had a minty flavor, but the flavor inclusion is actually not mint. It’s something else that’s far less common (but quite delicious). If pine tree oil is a new one to you, don’t worry. It was a new one to us too. Either way, this bar ended up being very tasty — and can definitely earn a shot at being a regular in your chocolate bar repertoire! A wonderfully aromatic chocolate bar (the reason for which will become obvious momentarily), this one was probably either instantly recognizable or virtually unguessable. Why? Because the flavor included was a popular tea. That’s right — Earl Grey tea was the ingredient that gave this bar its flavor. And we think it turned out quite nicely. What exactly does Earl Grey tea consist of? So, we looked it up, and although the flavor is quite complex, the basic flavors that comprise Earl Grey tea are simply its black tea base and oil of bergamot orange. This was a chocolate bar with split personalities. First, you get a nice, easygoing milk chocolate flavor, with a slight crunch. Then…things change and you get a “kick”. Indeed — this bar gives you a “kung pao” kick of spice at the end, and it lingers for a bit. No Replies to "August 2016"